Microsoft has been using the Marvell AVASTAR wireless solution in Surface for its entire history, and apparently they have no intention of stopping now. The problem with this is that we’ve seen a lack of progress in the laptop wireless market with the exception of Intel, who releases new wireless solutions pretty much annually. The Marvell NIC has never been the fastest, or the most reliable, so it’s very strange how Microsoft continues to use it in every device. If you had to pick a flaw with an otherwise premium product, this would be it. 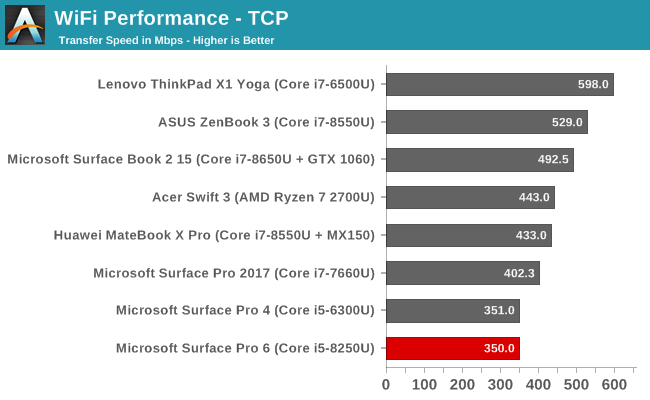 The performance of the 2x2:2 802.11ac in the Surface Pro 6 is not acceptable in 2018. Intel’s latest 9265 wireless offers 2x2 with 160 Mhz channel support for up to 1.7 Gbps maximum connection – if your router supports wide channels of course – and MU-MIMO as well. The AVASTAR wireless in the Surface Pro 6 is well behind the latest offerings, and should be replaced. 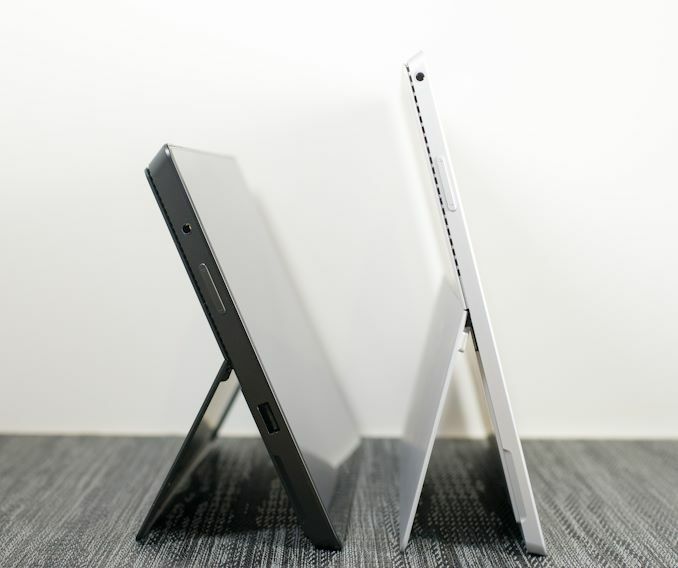 The speakers in the Surface Pro are forward facing, and tucked neatly into the bezels with a black finish that makes them almost disappear. Listening to the new Surface Pro 6, it would appear that the speakers are unchanged from the previous model, with 1.6 Watts of power and Dolby Audio Premium for sound processing. The speakers aren’t the loudest around, getting to just around 75 dB(A) measured one inch over the trackpad, but they do sound quite good for a device of this size. Last year, Microsoft ditched the fan on the Core i5 15-Watt Surface Pro, and for 2018, they’ve stayed with the same thermal solution despite doubling the cores. 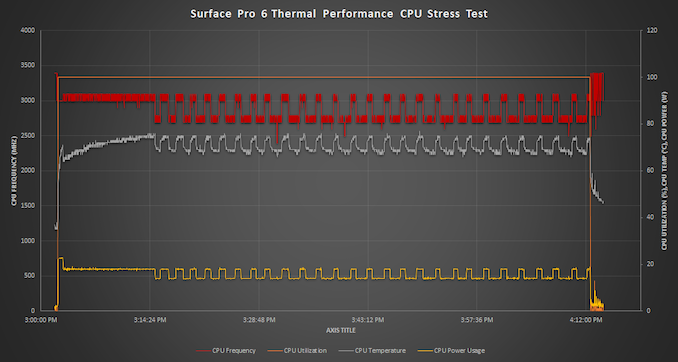 This is the first laptop class device we’ve been able to test that has foregone active cooling on a 15-Watt SoC. Core M, and the newer fanless devices based on the renamed Core i5 and i7 generally feature Intel’s Y Series CPUs, with a 4.5-Watt TDP. We did not get a chance to test the fanless Surface Pro last year, but the passive cooling solution needs to be able to dissipate the full 15-Watts in order to maintain performance over time. To test this, the CPU was run in a stress test which pushes it to 100% CPU utilization for the entire test. Most workloads are not going to be this aggressive, but this is a worst-case scenario for the device, and if it can perform well here it will not have any issues in shorter workloads. The Surface Pro 6 did very well despite the lack of active cooling. Over the duration of the stress test, which was about 1.25 hours, there was no downward trend of performance, and the system was in fact able to deal with the full TDP of the processor without any cooling at all. At the start of the test, the CPU ramped up to 100% speed on all cores, which was the 3.4 GHz maximum boost frequency of the Core i5-8250U, but once the workload started on all cores, all cores scaled back to 3.0 Ghz with a power draw of just under 23 Watts. We’ve seen on Core i7 models with active cooling that Kaby Lake Refresh can draw up to 30 Watts on PL2, so it’s likely that the PL2 level was reduced on this device. Still, even with no active cooling, the CPU was able to maintain the four-core boost frequency of between 3.0 and 3.1 GHz for a full 13 minutes before it started to throttle down to between 2.7 GHz and 2.8 GHz, and then it would bounce back and forth between that level and the 3.0-3.1 GHz level for the duration of the test. This reduction would have been to maintain the surface temperature of the device to the desired level. Once the device cooled a bit, it would ramp back up again, as you can see in the graph. Over the entire duration of 1.25 hours, the average frequency of the processor was 2.9 GHz, with an average power draw of 15.5 Watts. The CPU temperature averaged 69.9°C. 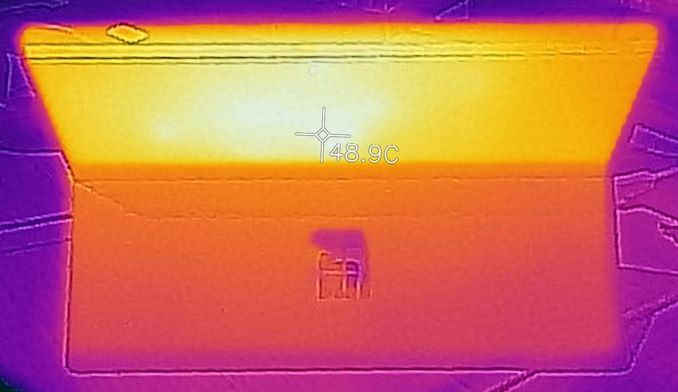 The outside of the device did get hot, but no hotter than previous models with active cooling. The maximum device temperature was over 48.9°C, which is warm, but only about 1°C hotter than last year’s Core i7 model with a fan. In terms of a performance impact, we already saw on our system performance that the Core i5 slots right in where you’d expect, and in fact on the x264 test, it ended up ahead of even the Core i7 devices we’ve seen, and that test is a full CPU load for about an hour, so there appears to be little to no performance loss despite the passive cooling. And the upside is a completely silent device, which is a great trade-off. 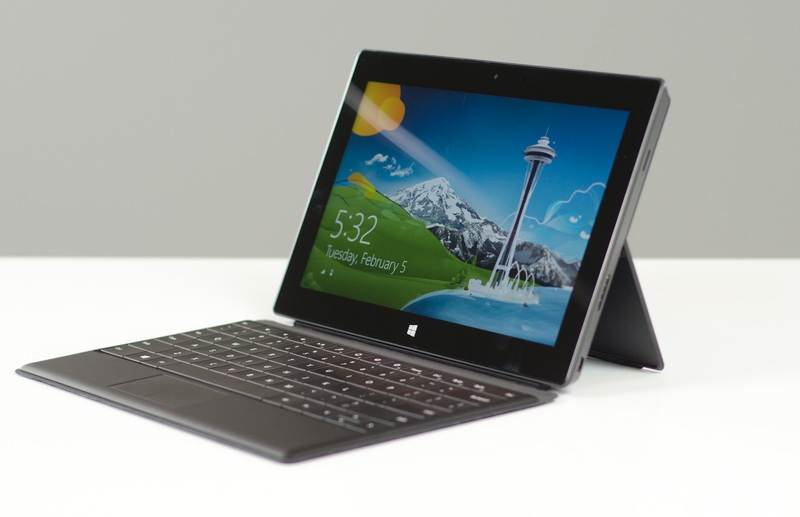 Now on their sixth iteration, the Surface Pro lineup has become the staple for Microsoft’s PC efforts. They’ve launched several impressive devices, such as the Surface Studio, and Surface Book, and other less impressive, such as the Surface RT, but the Surface Pro has really been the one device that has provided the most scale for Microsoft’s PC efforts, so why not go over the lineup from the beginning. The original Surface Pro was a technological marvel more because it packed an entire laptop into the size of a tablet than anything else. 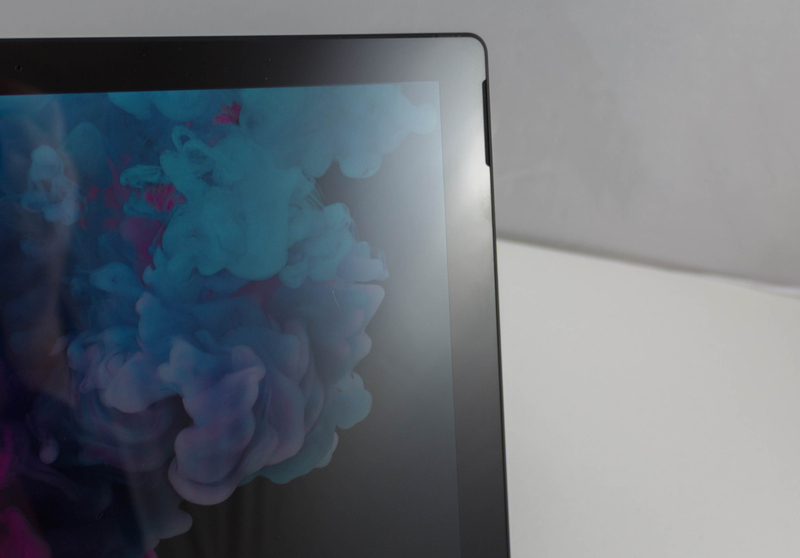 At 2.0 lbs, it was a heavy tablet, and at 0.53-inches thick, it was thick for a tablet, but nevertheless, it shoehorned a 17-Watt Core processor into a thin and light form factor. 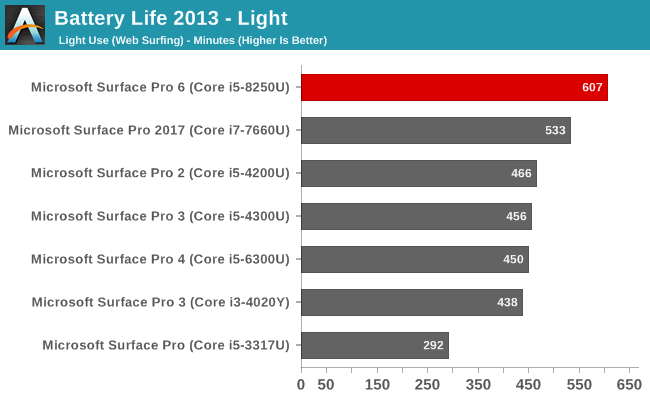 The Surface Pro 2 was the same dimensions and weight, but made the big jump from Ivy Bridge to Haswell. The real kick for Surface Pro was with the Surface Pro 3, which introduced the now familiar form factor, ditching the 1920x1080 display and going to a 3:2 aspect ratio 2160x1440 panel in a form factor that was only 0.36-inches thick, and 1.76 lbs. That was a big drop in thickness and weight compared to the Surface Pro 2. It also introduced the infinitely variable kickstand, which has been an important component in the success of the device. The Surface Pro 4 stretched the screen slightly from 12-inches to 12.3, and increased the resolution to 2736x1824, where it has stayed for the last three generations. Surface Pro 4 also drastically improved the keyboard type cover from the terrible state it was in previously to the same design we see today. If it wasn’t for the nasty power management issues with Skylake on a Modern Standby device like the Surface Pro lineup, this model would likely go neck and neck with the Surface Pro 3 on what device offered the biggest upgrade. Luckily you could use the new type cover on the older Surface Pro 3, so perhaps that was the ideal combination at the time. Surface Pro 2017, which dropped the numbering system for apparently only one generation, was a very safe upgrade, but did fix the power management issues of the previous generation device. Surface Pro 6, as you’ve seen if you’ve read this far, is also a very safe update, with still no USB-C replacing the mini DisplayPort, but a big jump in performance with the quad-core Kaby Lake Refresh, an even better display, and much improved battery life. With six iterations under its belt, this seems like a great time to compare how far Surface Pro has come in a couple of key areas: performance, and battery life. The original launch of Surface Pro promised laptop level performance in a tablet, and it delivered, but where is it compared to today? The original Surface Pro launched with a 22 nm Ivy Bridge processor, and power hungry Wacom digitizer, so how has the battery life improved over the years? Since our benchmarks evolve over time, we don’t have all of the same results available for all of the devices, but we do have a couple of metrics that are worth comparing. First up is Cinebench 11.5, which is the older test compared to what we use now, but we’ve continues to run the older one as well to reference against older devices. Looking first at the single-threaded results, it’s fairly interesting that the slowest device is in fact the Core i3 version of the Surface Pro 3, which was the first model to ship with a Y series CPU. We’ve not been able to test the later Core m3 models, but the Haswell version of the Y series was not particularly strong, and the TDP was still 11.5-Watts. 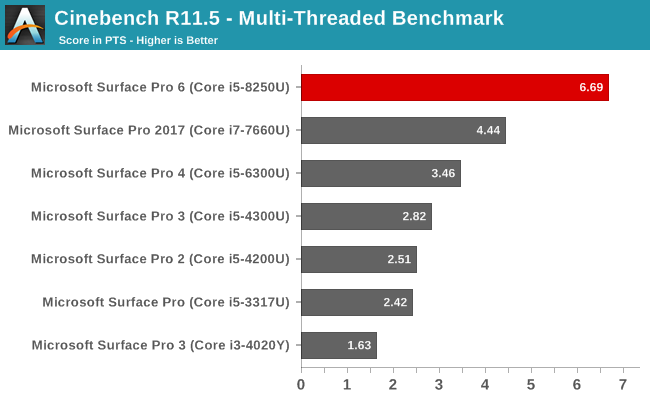 The single-threaded results more or less mimic the gains that Intel has made in processor performance, since none of the devices would be thermally limited at all on a single thread. 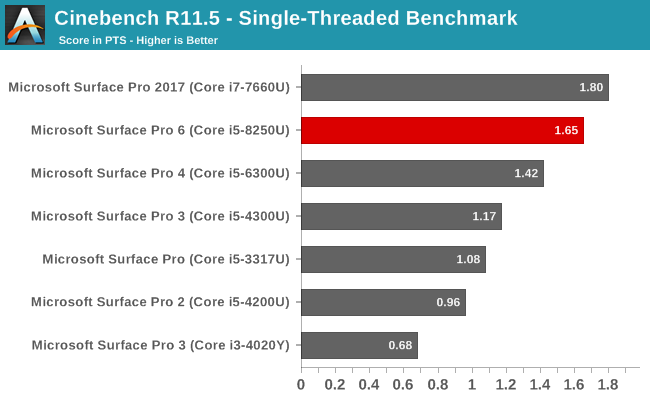 The Core i5 in the Surface Pro 6 can’t quite reach the lofty level of the Core i7-7660U from last year with just one thread, and the 2017 model was likely helped by the extra eDRAM cache as well, but comparing the single threaded Core i5 results, the Surface Pro 6 is 52.7% faster than the original Surface Pro. The results change dramatically though with the multi-threaded results, as you’d expect since the latest model doubles the cores and threads. Surface Pro 6 is 176.4% faster than the original model in this test. What these aren’t able to show though is how far the cooling has come. 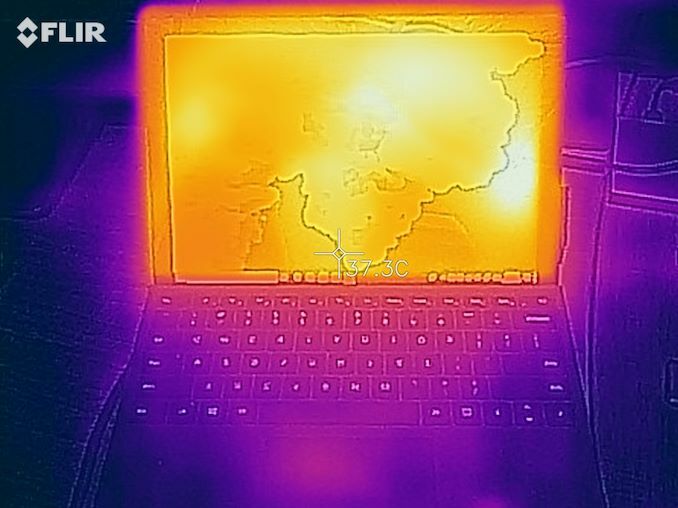 The original Surface Pro and second generation devices were thick enough that they could do a reasonable job removing heat to keep performance up, but the thinner and lighter Surface Pro 3 had a fan that would come on whenever you turned your head to look at the device, and it also struggled to maintain performance under load. 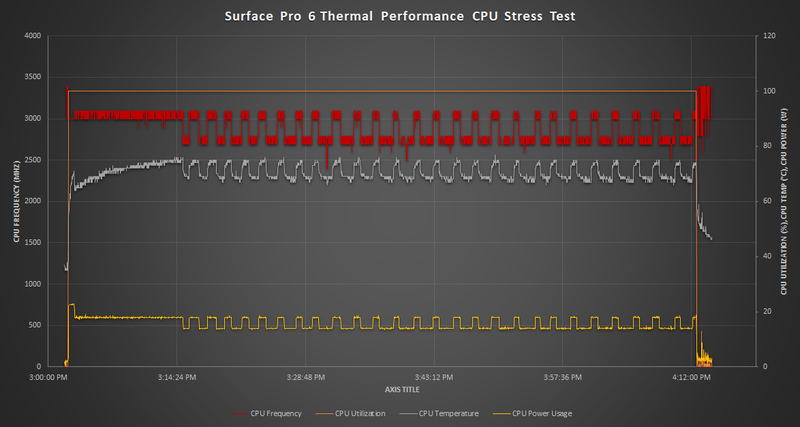 Surface Pro 4 improved the cooling significantly, and the move to Skylake and the smaller process likely helped out as well, but it could still be loud under load. With the launch of last year’s Surface Pro (the no-number version) Microsoft dropped the fan completely in not only the 4.5-Watt Y series CPU, but also the Core i5 15-Watt model. Unfortunately Microsoft never sampled us the Core i5 model so we could see how that impacted performance, but the Surface Pro 6 features the same fanless design, and it is nothing but impressive. As we saw in our thermals, the design is able to cope with the heat produced by the processor very well, and the processor is able to hold right around the 15-Watt TDP for as long as you need. It does fluctuate down to just under 14-Watts, but averages around 15-Watts on long tasks at full CPU load. So we’ve gone from loud, to louder, to faster, but quieter, in just a couple of models. In terms of battery life, we’ve run our 2013 test on all of the Surface Pro devices over the years as well. The original Surface Pro could not even get five hours of battery life on our lightest battery test, but the Haswell based Surface Pro 2 increased the battery life significantly over the original model. In fact, thanks to a smaller battery capacity, the newer models haven’t quite been able to achieve what the Surface Pro 2 did, until the 2017 model last year. The last generation and the Surface Pro 6 though have both made significant gains in terms of battery life, to the point where the Surface Pro 6 can almost achieve the same battery life as an iPad in light tests. 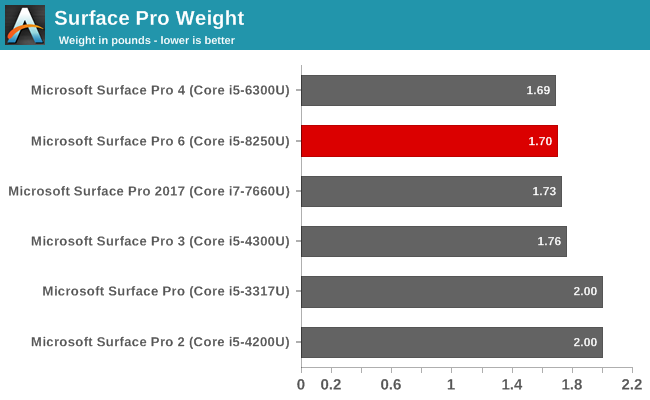 In terms of efficiency, since the Surface Pro 2 and 3 were both based on Haswell processors, they are amazingly similar in terms of efficiency, although the older model is slightly ahead. Surface Pro 4, 2017, and 6 have all started to stretch that out though, with Pro 6 being 82% more efficient than the original model, and 14% more efficient than the Surface Pro 2, despite a much higher resolution display in the newer version. Surface Pro has been the staple for Microsoft, and the improvements every generation have been both subtle and impressive, but over the life of the device, it’s amazing how far it has come.